Bobby R. Goldsmith is a writer and editor with over 12 years of experience in journalism, marketing and academics. His work has been published by the Santa Fe Writers Project, "DASH Literary Journal," the "Inland Valley Daily Bulletin" and WiseGEEK. When a batter makes contact with a pitched baseball, one of two main things will happen -- it will either be ruled a fair ball or a foul ball. As long as its in the field of play, the ball is considered live and the defense must make a play. 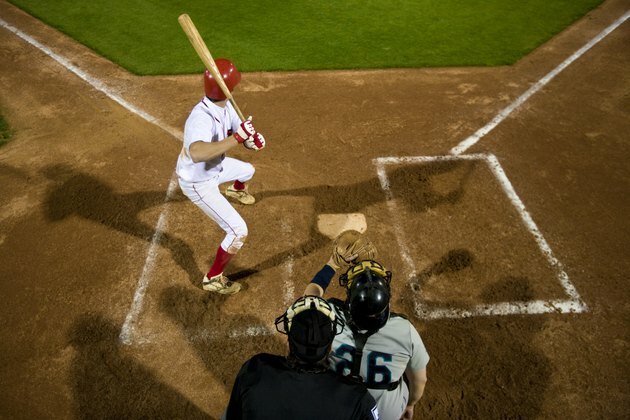 When the ball is hit into home plate, the end results could be either fair or foul, depending on where it ends up, because home plate is considered fair ground. If the batter hits the ball into home plate, it must roll forward anywhere between the first- and third-base chalk lines to be ruled a live, fair ball. It may also pop up into fair territory after striking the plate, or in very rare circumstances, it can strike the plate and remain there, between the chalk lines. If the ball rolls or pops up into foul territory after striking the plate, the umpire will immediately declare a dead ball, and all play momentarily stops. If the batter has less than two strikes, a strike will be assessed to the count. If the batter has two strikes, no other consequence will occur, and the pitcher must throw again. What Is a Touchback in Football?